Over the past three years, I have given much of my time and effort to serving the citizens of Johns Creek through the JCCA. During the past two years, I have taken on the challenge of leading this great organization as President. In that time I have faced many challenges, which includes guiding the JCCA toward a path of enhancing our purpose and function to the membership and in the community. 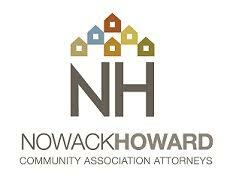 The JCCA has so much more to offer our membership than advising our member HOAs how to best handle a rezoning case. We’ve made great strides in working with our sponsors to bring our membership the educational opportunities that will help make their HOA Boards a success. As an organization we’ve experienced unbelievable growth, this has truly been a dynamic time for the JCCA. While the JCCA continues to evolve and grow, it will have to do so without me. I have recently had some life issues arise, and have decided to resign from the JCCA. At this time, the duties of President will be delegated to and divided among the Executive Committee consisting of Kirk Canaday, Kathleen Field and Michael Pelot-Hobbs until January 2018. They will split the responsibilities of the President as each issue is presented. As I leave this organization, I am sure that the JCCA membership is in quite capable hands and look forward to watching it continue on its current path. I am truly honored and humbled to have served my community. 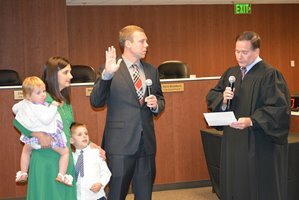 Fulton County Superior Court Judge Christopher Brasher swore in recently elected Johns Creek City Council member, and former JCCA Board Member, Chris Coughlin during Council’s April 24 regular meeting. Coughlin took the oath of office for Post 4, which was vacated after Council member Bob Gray resigned in February 2017. Coughlin’s term will run through November 2019. Many see this property as a gem of the City. The JCCA will send a special edition communication in regard to the potential sale/purchase of this Dean Gardens. A state-mandated burn ban on all outdoor burning is in effect from May 1 through Sept. 30. The Georgia Environmental Protection Division imposes the ban to comply with Federal Clean Air Regulations. According to the Georgia Forestry Commission, careless burning of debris is the leading cause of wildfires in Georgia. In the hot months of summer, the ozone in the air can reach unhealthy levels. Outdoor burning is a significant contributor to the pollutants that form ozone, according to the Georgia Environmental Protection Division. For more information about the burn ban, see the outdoor Burning Guidelines on the City website. 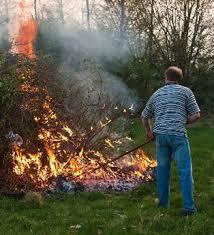 Submit an Outdoor Burn Request using this online form. Questions? 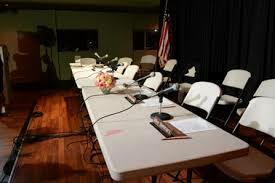 Call Johns Creek Fire Marshal Chad McGiboney at 678.512.3363 or email him atFireMarshal@JohnsCreekGA.gov. The City’s next monthly public update meeting regarding the proposed road widening projects along the McGinnis Ferry Road and Jones Bridge Road corridor will be held Tuesday, May 18, from 7-9 p.m. at City Hall. The public is invited to attend to receive the latest updates, ask questions, and provide input regarding each project. 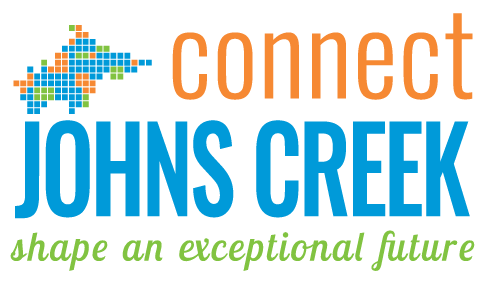 The City of Johns Creek is currently updating its Comprehensive Plan and we need your input regarding future transportation, commercial, and residential development needs. The draft plan will be available May 1, and the City needs your feedback. Goal 1: Create a citywide multi-modal transportation network. Reduce traffic congestion. Connect neighborhoods and schools. Goal 2: Create an identity for the City. Preserve existing character of residential neighborhoods as a guide for future development. Goal 3: Expand the City’s economic base. Goal 4: Provide superior recreational and cultural activities throughout the City. Positively engage our diverse population. 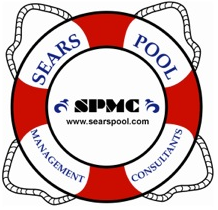 Goal 5: Develop tools needed to implement goals. 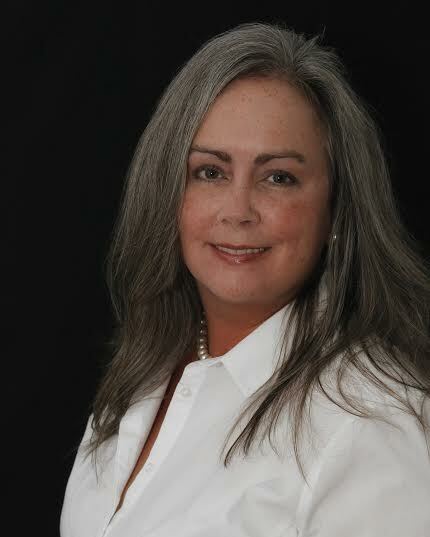 Revise the Zoning Ordinance and Development regulations. View the proposed Johns Creek Character Map as well as the existing Johns Creek Land Use Map. 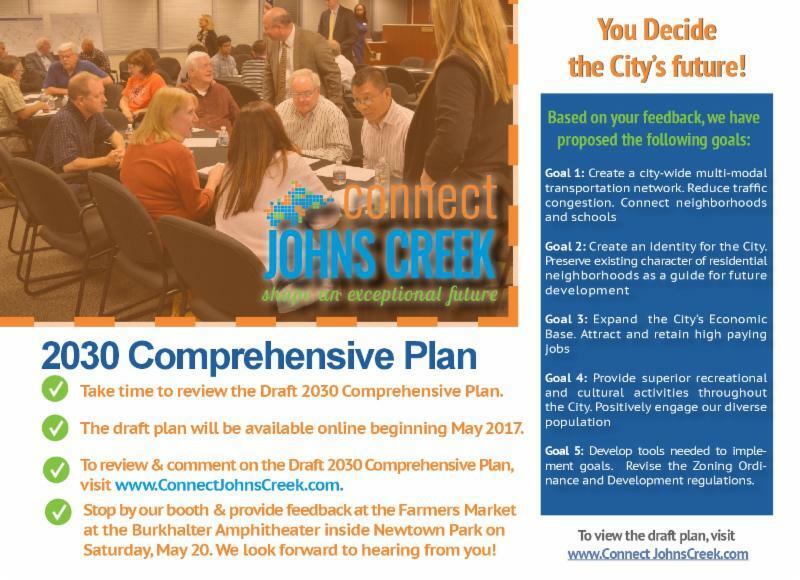 For more information and to view the draft plan on May 1, visitwww.ConnectJohnsCreek.com. The City of Johns Creek will begin to expand and improve the annual assessment of its storm drainage system. Following a Municipal Separate Storm Sewer System (MS4) storm water discharge permit with the Georgia Department of Natural Resources, the City is required to have an inventory of the storm drain system and Johns Creek must inspect 20 percent of the system each year. The inspection includes identifying City-owned pipes and structures that need to be cleaned or repaired. 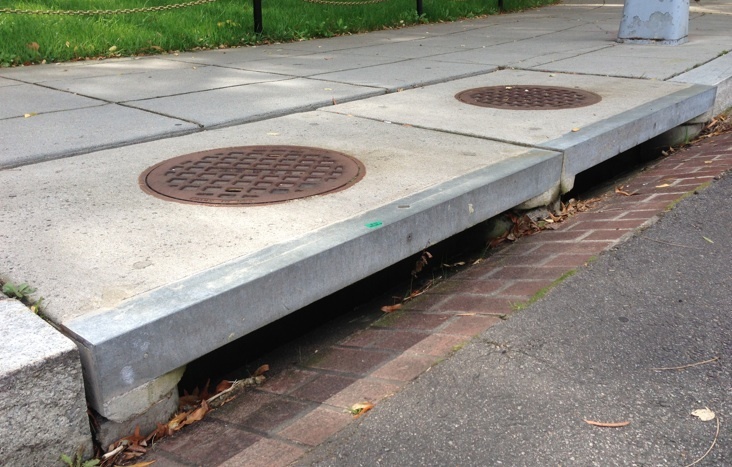 This year, the inspection program will include photographic records of the interior of storm drain pipes and structures. The City’s study contractor, Metals and Materials Engineers, will conduct the inspections, which are expected to take nine months. Crews may need to be on homeowners’ properties in order to conduct the inspections and they will have identification. If the homeowner has any concerns regarding the inspection and requests a delay in the process, the crew will notify the City, who will then follow up with the resident. The structures and pipes that need to be repaired will be placed on a list and repaired as funding and schedules allows. Urgent repairs will be prioritized and conducted as soon as possible. For more information, contact the City of Johns Creek Land Development Manager, David Chastant, at 678.512.3284 or email David.Chastant@JohnsCreekGA.gov. Viewed from a distance, the Chattahoochee River looks like a languid, easy-going river, but its appearance can be dangerously deceptive. When the Corps of Engineers releases water from Lake Lanier, the resulting surge of water can cause the river to rise several feet in a short amount of time. During the summer, the Johns Creek Fire Department Swift Water Rescue Teamresponds several times a month to emergency calls to rescue people from the frigid, rushing water of the river. In some cases, they’re asked to help recover bodies. 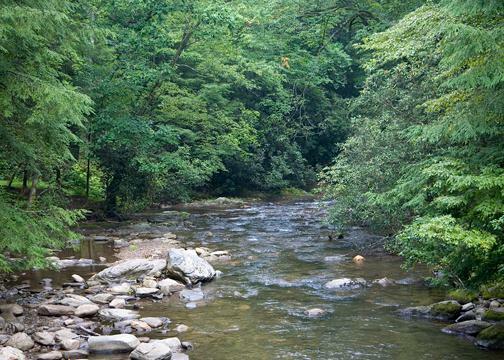 During a release, the Chattahoochee can rise as much as 11 feet in minutes. The water can be as cold as 47 degrees, enough to bring on hypothermia and hamper efforts to swim to shore. The Army Corps of Engineers releases water from Buford Dam during weekday afternoons unless there are unusual downstream water demands or especially heavy rains. In those situations, unscheduled water releases can come in the morning and on weekends. The Corps gives notice, but the announcements vary from a few minutes to a few hours before the releases. People can call 770.945.1466 or listen to 1610AM. River users may also view the daily schedule for releases (see the Buford column). Four warning sirens are placed between Buford Dam and State Road 20. Releases occur within minutes after the sirens stop. Call ahead at 770.9451466 to learn when releases are scheduled. It’s also a good idea to call just before entering the river. Be aware of the time and head for the shore when the release is scheduled. Even though it may take a while for the water to get to you, don’t wait. Always wear a flotation device. Keep an eye on the water level – note the water level on a solid fixture, such as a bridge support, and check it periodically. If the water level has risen, it’s time to get out! Just because you’re in a boat, don’t assume you’re safe. People have drowned after their boat struck rocks broadside and flipped. Make sure someone knows where you are. If you get into trouble, someone can find you and alert authorities. Pay attention to where you are – there are mile-markers along the river. If you have to make an emergency call, you can tell authorities where to find you. For more information, watch the JC Swift Water Rescue Team’s Water Safety Video, review the US Army Corps of Engineers safety tips, or download the attached Chattahoochee WaterSafety flyer. The JCCA is now on Facebook! Make sure you like our page to stay informed of events and information. Local families (Johns Creek and neighbors) who have a family member with a disability or special need are invited to help us kick off the summer season! 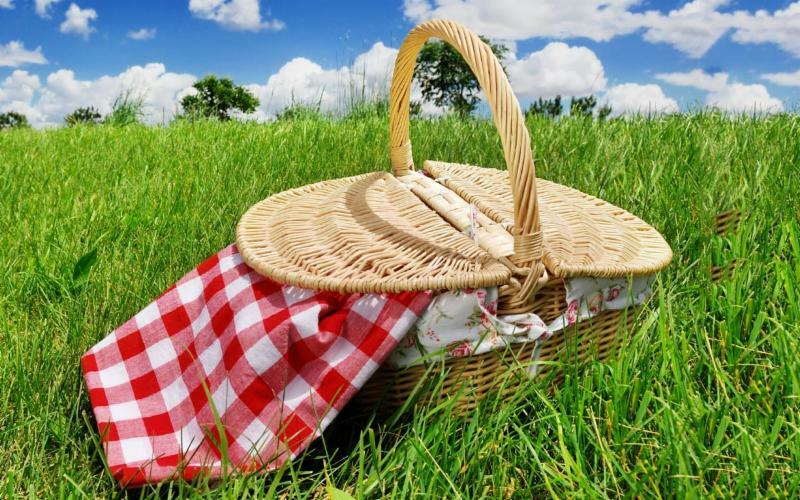 Joins us for the Johns Creek Summer Kick Off Picnic on Saturday, May 6 at Newtown Park, on the Park Place Event Lawn. The Hawaiian-themed event, sponsored by Great Prospects and Johns Creek Civitans, will feature games, music, food, prizes, and other activities. Festivities run from 11 a.m. to 1 p.m. and are open to all ages. Be sure to wear your favorite Hawaiian Shirt! There is no cost for the event but please RSVP by emailing Kirk Franz, Recreation Manager at Kirk.Franz@JohnsCreekGA.gov. 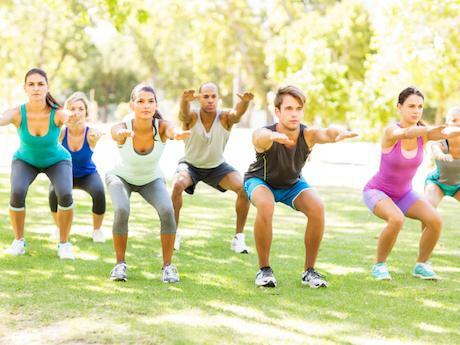 Free Outdoor Fitness is back at Newtown Park Amphitheater and Autrey Mill Nature Preserve. Looking to try something new or you just enjoy working out in a fun outdoor atmosphere, the Outdoor Fitness classes are a great workout. Certified instructors teach these popular classes and all fitness levels are welcome. The free group classes begin Sunday, April 9. Sign-in is at 8:45 a.m. and class begins at 9 a.m. All classes are one hour. Click here for more information. WANT IN ON THE ACTION? 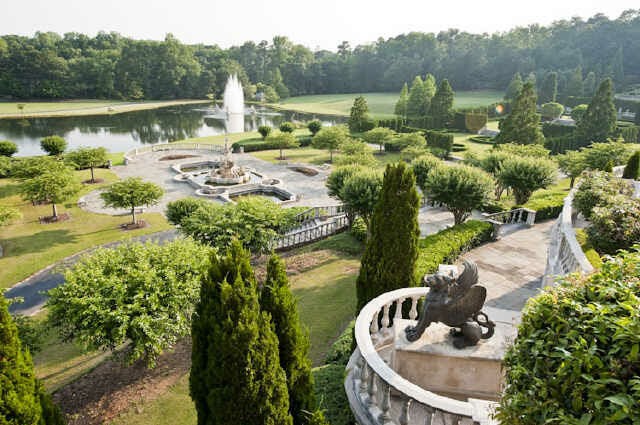 Subscribe to our mailing list and stay up to date on everything occurring in Johns Creek! Stay informed! 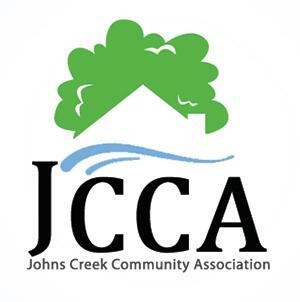 Click HERE to signup to receive JCCA emails. Please support our sponsors. To learn more, click on the sponsor name below. To see the entire list of news articles, click HERE.